Regardless of the size of your project, our talented Chinese translators thoroughly proof each document ensuring quality, accuracy and ultimately timely delivery. We also specialize in localization and media monitoring, which utilize cutting edge technology in order to exceed your translation expectations. 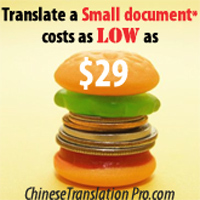 Fortune 500 clients trust Chinese Translations Pro to conduct translation services to maintain a competitive edge. That said we value the needs of every client. As corporate partnerships between American and Chinese companies strengthen, so does our commitment to providing the finest Chinese translation in the Northeast. You will soon be able to get an approximate price quote by using our translation online quoting system, although non-binding, our price quote would be reasonably accurate in helping you estimate the budget. You can do so even without a document by just key-in the approximate wordcount. If you have your document ready for translation, please forward us your document for a formal quote. Please note that we can NOT provide a formal quote without seeing the complete document.